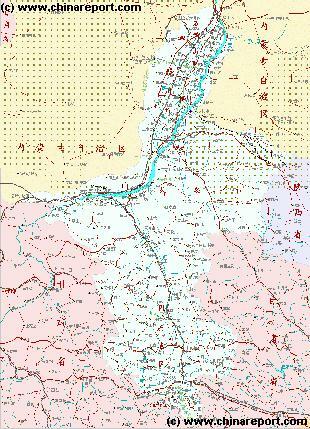 This Geographic Map gives a clear overview of NingXia Hui Autonomous Region in the Gobi Desert of Central North-Western China (P.R.C.). 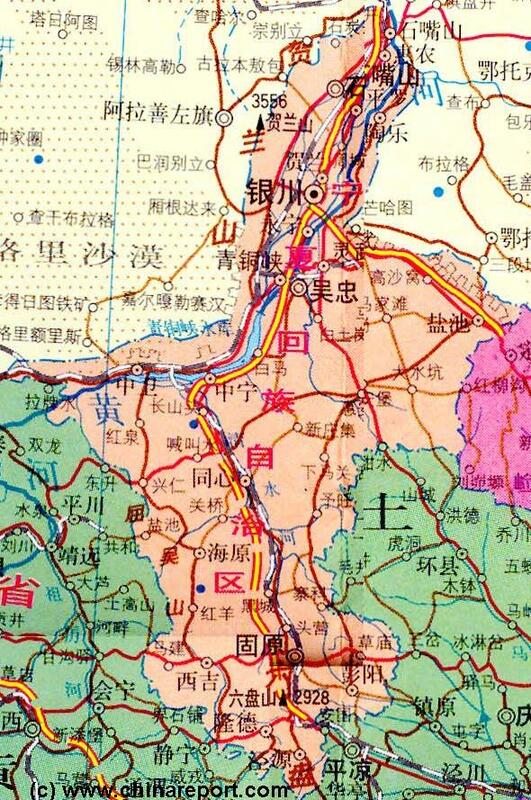 Going round the Map in clockwise motion neighboring provinces of NingXia are Inner Mongolia AR to the North-West, North, and North-East, Shaanxi Province to the East, and Gansu Province in the South-East, South and South-West. The Capital city of of lightly populated Ningxia, Yinchuan, can be found in the Northern parts of the Province, situated on the west bank of the Yellow River (Huang He) and at some distance due East of Helan Shan mountain-range (+/- 3500 meters) which protects it from the Dust, winds and Sand blown in from the TengGer, a sandy and dry part of the Gobi Desert of Inner Mongolia and NingXia. From Yinchuan west the world heritage Helan Pass leads away into Inner Mongolia. A Main feature of Ningxia Hui Autonomous Region is the Yellow River which is the main water source and life-line of this desert oasis Province with its Capital City. The Huang He (Yellow River) enters the Province from the West through Sichuan and Gansu Provinces, then passes through XinTongXia Water Reservoir, where it turns its Way North to pass East of Yinchuan on the way to Inner Mongolia. Other features are the Helan Shan Mountain Range in the West, in the shadow of which lie the Tombs of the 11Th Century Western Xia Dynasty and twin historic Pagoda's. Due East of Yinchuan lie the remnants of the Great Wall of China in the Ordos Desert of NingXia Hui and Gansu Province, where it forms the long border with Inner Mongolia Province until it continues Eastward into Northern Shaanxi Province. South of Yinchuan lies the huge Yellow River water reservoir of XingTongXia, where a magnificent green belt grows in between of dry and harsh lands. Atop mountains along the Western edge of the Reservoir another remote section of the Great Wall of China can be found, marking the border of Old Ming Dynasty China and Western Ningxia Hui Autonomous Region. The South is claimed by rough mountains such as XuanHua Shan and Xumi Shan (Treasure Mountain), making up the LuiPan Range. In this mountainous southern part of the Province, the Valley of the Qingshui River, a railroad and recently a highway lead South to pass an Inner Section of the Great Wall of China at GuYuan before meeting KongTong Shan in the far South, which forms the border with Gansu Province. From here it is +/- 130 kilometers to BaoJi in Shaanxi Province, the next main City Train Station. 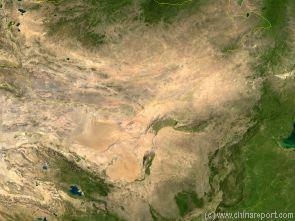 Satellite Image Overview of China, The Gobi Desert and flow of the Yellow River with NingXia Province clearly visible. Schematic Overview Map of Ningxia Hui 2A, More details on monuments, local landmarks, historic sites, heights and local geography.